Monday is a 40 year old (okay maybe a little older than 40) African American woman who recently relocated to Juneau, Alaska from the Washington, DC area. EverydayisMondayblog is an opportunity to share her adventures in Alaska with her friends and family. 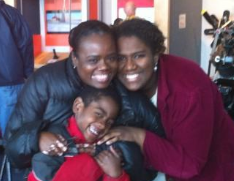 Oh and this pic….me and the loves of my life….. Imara and Johnathan at the Aviation Museum in College Park, Md.